Background Elevated blood pressure (BP) is a major modifiable risk factor. However hypertension still remains underdiagnosed, untreated or suboptimally treated. 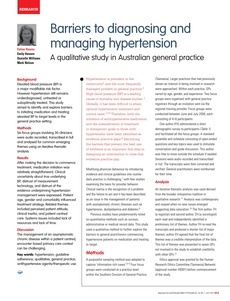 This study aimed to identify and explore barriers to initiating medication and treating elevated BP to target levels in the general practice setting. Methods Six focus groups involving 30 clinicians were audio recorded, transcribed in full and analysed for common emerging themes using an iterative thematic analysis. Results After making the decision to commence treatment, medication initiation was relatively straightforward. Clinical uncertainty about true underlying BP, distrust of measurement technology, and distrust of the evidence underpinning hypertension management were expressed. Patient age, gender and comorbidity influenced treatment strategy. Related themes included perceived patient attitude, clinical inertia, and patient centred care. Systems issues included lack of resources and lack of time. Discussion The management of an asymptomatic chronic disease within a patient centred, encounter based primary care context can be challenging.